A lighter, stronger version of the original President, the President XT is equipped with a smooth front drag system with stainless steel and oiled felt washers. 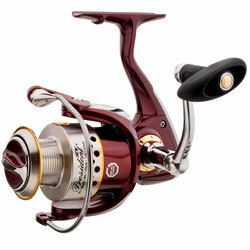 Weight-saving features include an anodized aluminum spool with distinctive hole pattern for lighter weight, corrosion-resistant stainless steel components, machined-aluminum handle with Soft Touch knob, 9-bearing system with one-way clutch bearing, Sure-Click Bail, titanium spool lip and line roller. An aluminum spare spool is included. "i have almost all pflueger reels and this is an upgrade i must say"
"this reel is a great one for bothe fresh and salt water. it is durable and is well worth the money. pair it up with a medium or medium/heavy action rod and your on your way. the only thing is you have to make sure you fill the spool correctly. if theres not enough line then it will drastically affect your casting distance"
"This is a great reel that I use on a medium/heavy actoin pole. It has never let me down." "This reel is very good for the money. It's not quite as smooth as I'd like but its decent. Great for crankbaits. Doesn't have as good as retrieve as my Supreme."